Wellington City Council marks 100 years since Gallipoli. By councillor Andy Foster. One hundred years on, it is almost impossible to imagine a repetition of the fervour around the British Empire that greeted the outbreak of World War I. Redmer Yska’s excellent book Wellington: Biography of a City paints a vivid picture of the period and the impact of the Great War on Wellington City Council. I hardly need to mention that this was the impact on the city, nation and empire in microcosm. 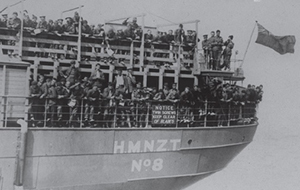 Soldiers on ship – circa 1914. “When war broke out in August 1914, Mayor John Luke, fresh from a briefing in Prime Minister William Massey’s office, urged citizens to support the British flag. 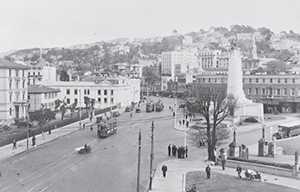 Wellington was the country’s main point of departure for troop convoys – so the city council was regularly involved in farewell ceremonies at the Basin Reserve. By September 1915, Wellington Town Hall had been turned into a recruiting station. Free use of the hall was granted “for patriotic purposes”. The Municipal Officers’ Association was granted permission to turn part of the basement into a rifle range. So many council staff were joining up that by February 1916 the Fire Brigade was asking the government to exempt the urban-based fire services. Elevated view of Lambton Quay and the Cenotaph War Memorial. So great was the general manpower problem that councillors took the unprecedented step of training women as gardeners. The aim was to give them “the privilege of being taught such gardening work as the Superintendent of Reserves deems suitable”, although the council “was not to be placed under any obligation, moral or otherwise, to give them employment after the expiration of their training period”. The women later had the audacity to ask to be paid. With the contentious introduction of conscription in 1916, the council resolved to do everything possible to forward the objectives of the Recruiting Board. It refused to allow the Anti- Conscription League (with future Prime Minister Peter Fraser among its supporters) to hire the Town Hall. Lady Stout, wife of the Chief Justice, was however “allowed to use the Concert Chamber for her lecture to the Anti- German League”. As the war neared its end, a captured Turkish machine gun was mounted on the first-floor landing of the Town Hall. In September 1918, Mayor Luke, now an MP in Massey’s government, led the councillors in three cheers to express “thankfulness and joy at the glorious part taken by the New Zealand soldiers in this Great War”. Captain S A Atkinson. 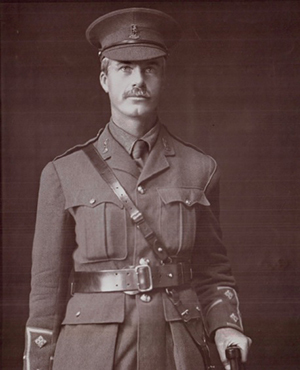 Killed in action – circa 1917. Among a total of 10,000 men from the Wellington province, some 232 council staff went to war. Of those, 22 died in the war and another 24 were wounded “or gassed”. This is truly horrifying stuff – perhaps we can all be thankful that, 100 years since, people arguably have access to better information that allows them to make informed decisions about participation in foreign conflict. But that is, of course, a matter for intense and serious debate. As the capital city, Wellington will this month rightfully have a central role in the commemoration of the Gallipoli centenary. The new National Memorial Park, Te Pukeahu, will be the fitting centrepiece of Anzac Day. The Australian government has generously contributed to the construction of this memorial. The city council itself is organising an Anzac Day Eve parade from Parliament to the new park. This parade will be solemn but spectacular. It will be a chance to remember the brave men from the city and province who died or were maimed in World War I. This article was first published in the April 2015 issue of NZ Local Government Magazine.